A relatively unexplored area of decorating is the selection and placement of movie posters. Posters reflect a persons's taste and passion. While some posters may only be purchased because their shape and size covers imperfections in a wall, some may take on the aura of family portraits. This poster adorns my kitchen bringing a touch of mystery and culture to the centre of the household. As I spent a joyful couple of hours going through the wares of a shop it occurred to me that I - one of the world's noted Charlie Chan fans - I did not have a Charlie Chan poster among my collection. I turned to the vendor's assistant and, barely able to contain the excited anticipation from my voice, asked "Do you have Charlie Chan at the Opera"? "Why?" he responded. "What's so hot about Charlie Chan at the Opera?" Taken aback may accurately describe my reaction to his query, but it was more than that. I was shocked. It's always surprising when the people who sell these treasures aren't as committed to the items as the customer. Where, I wondered, oh, where was that nice teenage girl who was here a couple of months ago? We had rhapsodised for a good half hour on Im-Ho-Tep. "Perhaps," I responded politely, yet coldly, "if I used the full title card you will realize the folly of your question. 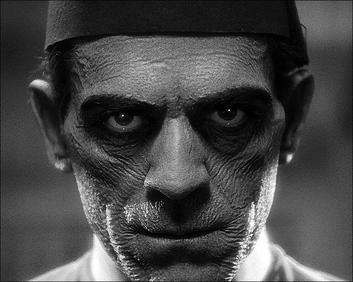 I am speaking of Warner Oland vs. Boris Karloff in Charlie Chan at the Opera." Unimpressed, the lackey pointed in a vague direction. "Yeah, that's here somewhere." I love a mystery and a backstage mystery is something special. When that backstage is at an opera house - well, it just doesn't get any better. Boris is a sympathetic and confused mad man as opera star Gravelle. Is he seeking vengeance or justice? His presence as a character and as a star brings an added oomph to this highlight of the Chan series. Maurice Cass as Mr. Arnold has the immortal line: "I'm stage manager here and this opera's going on tonight even if Frankenstein walks in." As a child catching this movie on the late show my heart ached for poor misunderstood Gravelle. As an adult with box sets, it is a marvelous trip down memory lane. Somewhere along the line I've almost convinced myself I must have seen Oscar Levant's Carnival on PBS. Have you ever noticed that an inordinate number of soprano heroines are called Lenore or Leonora? The Mummy has proven a more problematic decorating item. While Jack Pierce's artistry is not to be denied, when one lives with others one must be aware that not everyone has the same sensibilities. I have found that placement in a dimly lit area of the house has worked well. A hallway or stairway leading to the basement. It adds to the creepiness while also affording an out for those who want to avoid its presence. On the other hand, there doesn't seem to be a place where Ardeth Bay is welcome. I'm considering the corner of a window in place of a "this property protected by such-and-such alarm company" sticker. 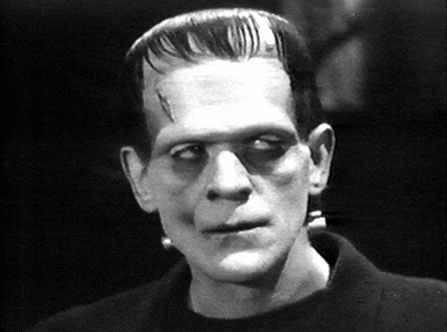 Fortunately, I have found that Frankenstein's Monster is good to go anywhere. He's not just for Hallowe'en. The perfect fashion accessory for T-shirts, tote bags, handbags, backpacks and school lunch bags. A companionable face in a nursery. A sympathetic one next to the bathroom mirror. He makes a great conversation piece when framed and set among pictures of school children. 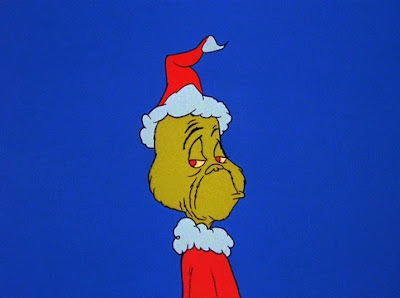 Of course, this time of year the Grinch is de rigueur. A tree ornament is a nice subtle touch. Perhaps a stuffed Grinch glowering from the corner. Husbands make a fine substitute. The folks three doors down have a large inflatable Grinch that sits atop their garage to the delight of the neighbourhood. The odd elf may get toppled over before the 25th of December, but nobody messes with the Grinch. 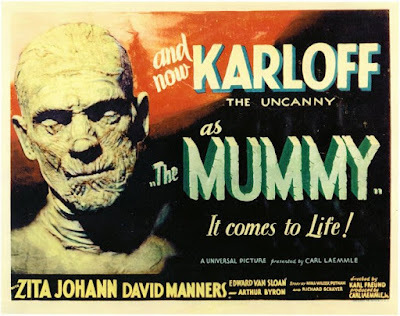 Frankensteinia hosts The Boris Karloff blogathon running from November 23rd - 29th. 1) The paragraph on Frank's Monster made me laugh out loud. 2) We can heart him all we want, but remember another line in the movie from the stage manager: "Did you ever know a baritone you could trust?" 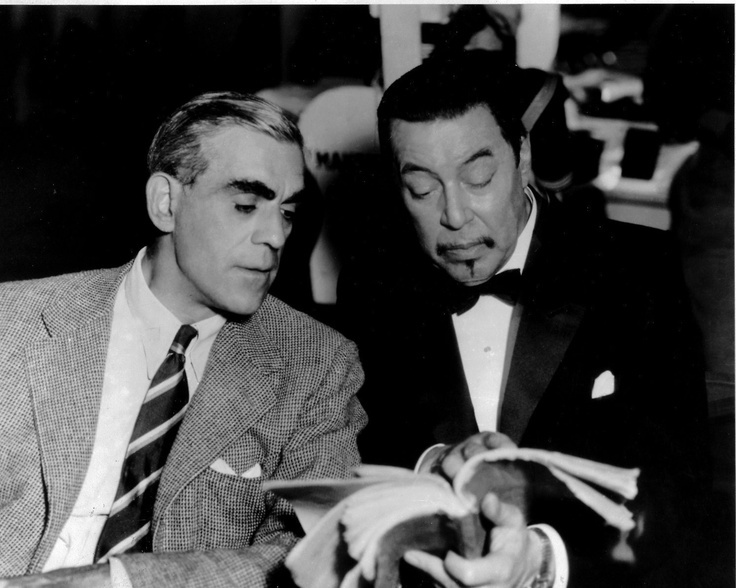 Oh, what a fabulous photo of Warner Oland and Boris on set. It has been my favourite CC movie....forever. I agree, Miss McC. It makes me smile just to look at it. This is just wonderful. I've been that customer, too. 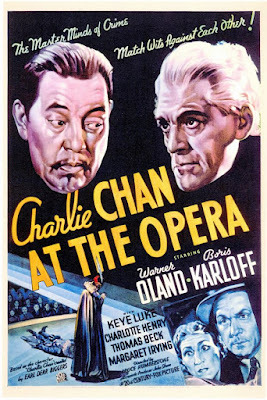 Now you've made me want to see "Charlie Chan at the Opera". I've never sought it out, because all I've seen of it is the photo of Boris in the goofy-looking Mephistopheles costume, which didn't seem all that promising. I'll try and see it and decide for myself. Also, that picture with Warner Oland really made me smile. My crush on Boris is only getting stronger. Very funny post. The picture of Imhotep with evil-sorcerer-eyes would make a good "Uncle Sam" parody poster. "I Want You! ...to share an undead eternity!" "What's so hot about Charlie Chan at the Opera?" The proper response to this would have been "Shut up, that's why." Hi there, teenybuffalo. CC at the Opera is one of the best of the series. I'm sure you'll enjoy it. Have fun! Well, Arbogast, while the "shut up" was implied, I do endeavour to be polite at all times. Also, when I'm in shock the brain and tongue don't always work the way I'd like. Who am I kidding? I'm frightened of surly teenagers.